This is a post in which you get to learn of one of my great aversions. I am not a bug person. At all. It is with great sacrifice I acknowledge that they exist in the first place because I am not a bug person. I would rather that they not exist. I would rather not know of them. I am also the mother of two little boys. I've tried not to scare or scar them. I do not name my fear to them. I do not scream at the sight of a bug in their presence. I try not to let them see me shift away from the ugly creatures, least they somehow get the idea that bugs are bad. (Even though they are. Horrid, slimy, icky things.) If I do not scream and do not run from them, hopefully my boys will grow up thinking that bugs are ok things but, just perhaps, better off dead. I wish my youngest son wouldn't pick up caterpillars. But I won't stop him. I just send intense looks to my husband, begging him to remove the child and offending insect from my presence. I also make sure my youngest washes his hands thoroughly after touching these creatures. I do allow books about bugs into the home. I just don't read them with my kids. Daddy does that. They all learn together. It's like a bonding experience or something. It doesn't include me. And I'm good with that. I had to force myself to actually look inside of The Secret Lives of Backyard Bugs in order to tell you about it. After all, I write the reviews around here. This book has a lot of full page-spread photographs of bugs. Big bugs with big heads staring at you, right in the face. Looking at the page of honeybees wasn't so bad. They are, at least, fuzzy. Each page spread apparently focuses on one particular type of backyard bug. (I don't want to freak myself out by informing myself about how many variety of bugs MAY live in my backyard.) On the bee page I see that there is about three paragraphs of information, with several upclose photos as well with detailed descriptions on the bee's activity and body parts. A quick perusal of the rest of the pages indicates that each page spread is more or less the same. 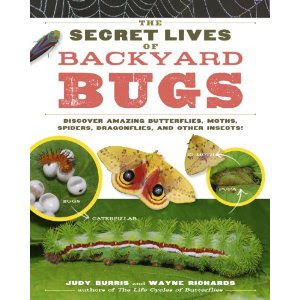 The Secret Lives of Backyard Bugs features Lightning Bugs (I can tolerate those! ), Dragonflies (we see those around from time to time! ), Stink Bugs (I hate them), the Monarch Butterfly (very pretty, really), various moths and the Black Widow Spider, among other more and less notorious bugs and insects. There are 108 pages in this book, which begins by introducing season cycles, plant life cycles, soil life cycles and the life cycles of insects and spiders. (I prefer to end the life cycles of all bugs the moment I spot them!) The idea of this book is, of course, to make your child curious about the world right outside their front and/or back doors and it does that. I saw my boys peering at each page intently and occasionally remarking about some bug that they apparently saw in our yard. (I shall not think on such things.) It is a clever and informative book which they have enjoyed (enough to start touching every bug in sight! Must we do this!?) It does seem to be a very good resource for little explorers and is worth mentioning. And so I have done so. And so I shall stop doing so, so that I can think about something else. Thank you, Storey Publishing for sending me a copy of this book to share with my kids and avoid looking at myself. My opinions about bugs should rather be discounted. I know that there are people out there that like them. You all just have at it! But steer clear of me! You crack me up. My children have been taught that bugs live outside...they were created to live there. But in my house they are not supposed to live. I encourage touching, not squishing outside...with good scrubbing afterwards. This book sounds beautifully icky and lots of fun-filled info! Giggle--what a fun review! And it sounds like a book we definitely need to pick up for our nature walks (which my 5 yos and 3 yod love!). You should see my 3yod--she almost always has some kind of bug or amphibian in her hands! The other day I was working in the herb garden and found a snake under the chives--she was the first one to arrive at my call! :) (All this to say don't count on your precious little girl sharing your aversion, lol). I predict a son who is an exterminator and a daughter who is an entomologist. Oh, you poor you--having to look at all those bugs.